As part of the 3-day Mojang & Humble Bundle run Mojam 2 (a live-streamed charity game jam that raised over $500K and resulted in Minecraft's Notch shaving off his beard), Vlambeer - the Dutch indie-heroes responsible for Super Crate Box and Gun Godz - created Wasteland Kings, an 8-way scrolling post-nuclear shmup featuring heroic, shotgun-wielding mutant fish, plants and silicon-based crystal lifeforms duking it out for supremacy and ownership of the blasted remains of human civilisation. Using a 2.5D perspective, the game instantly bought back memories of the ancient DOS classic C-Dogs - albeit with a modern WASD and mouse control combo - and although there are only three different worlds and a small number of different enemy types, the fact that each level is generated randomly is enough to keep the experience from growing old. Add to that the five different player character classes (each with their own stats and special attack) and a frankly ludicrous arsenal of weaponry, it has to be said that compared to the other games created during the jam, Wasteland Kings is certainly the highlight. Interestingly, traditional power-ups have been dropped from the game design in favour of a leveling-up system. 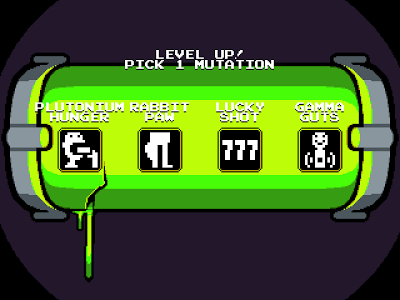 Your mutant warrior collects plutonium capsules with each kill (as well as the occasional ammo or weapon drop) and if your radiation quota is full at the end of the level you can select a new mutation, giving your character special abilities (increased melee range, extra health, speed, etc.) 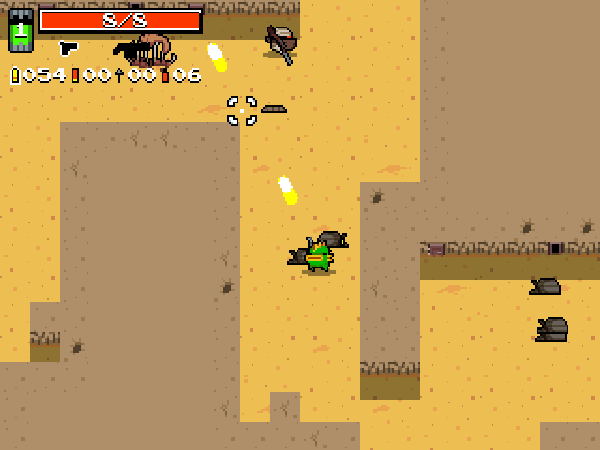 and affecting gameplay (reduced enemy health, kills regenerating player health or ammo, and so on). This makes the game hugely replayable, with no two play-throughs ever alike. 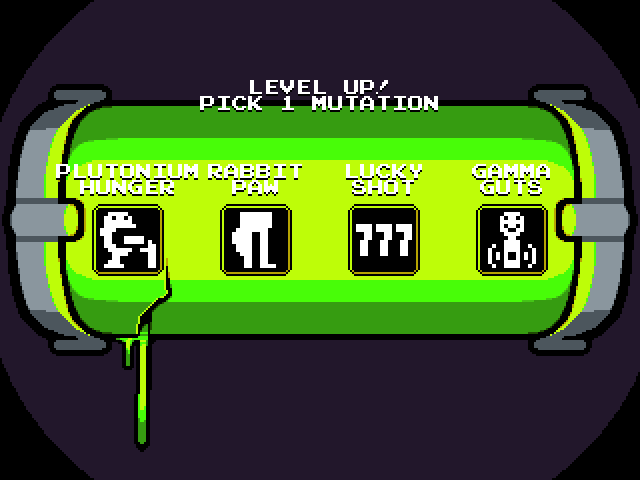 It's worth noting that your character maxes out at level 9, so some of the special powers (Plutonium Hunger, for example) are not really worth collecting. 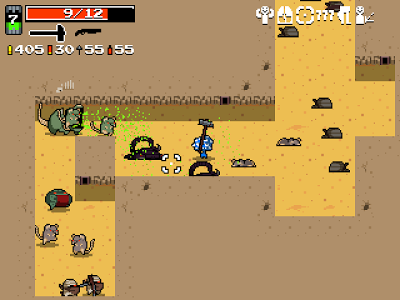 Each world features three stages and comes with its own distinct array of enemies, with the desert home to maggot-filled carcasses, scorpions and Tusken Raider lookalikes, the dark and dank sewer populated by giant rats and the city/bunker/scrapyard with its army of stick-wielding robot ninjas. 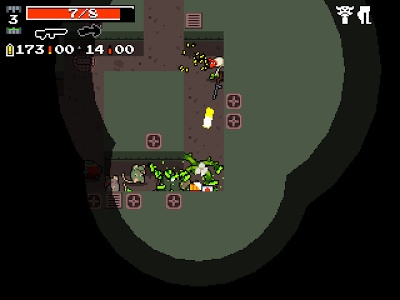 Treasure chests containing weapons and ammo are scattered throughout each maze, and upon killing the last enemy you are automatically sucked into a vortex and dropped into the next battle zone. 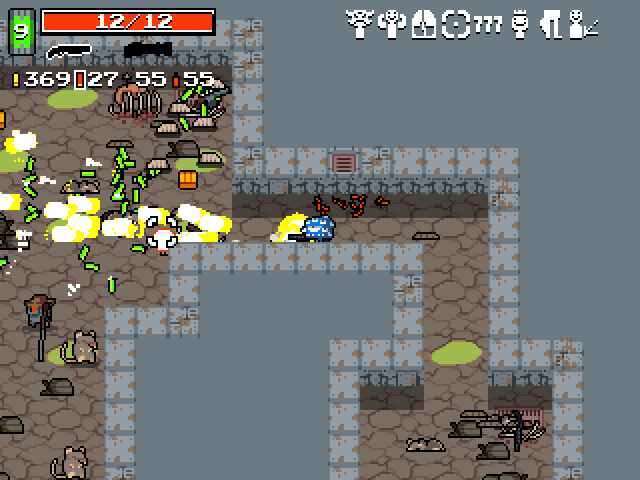 After the first loop (level 10) things get really crazy, with the game throwing monsters at you from across the entire range. At these later stages it doesn't take long for your ammo to run dry and for the sheer number of enemies to overwhelm you - but, hell, it's hugely fun whilst it lasts. In fact, part of the reason you'll run low of ammo is because the weapons are extremely satisfying to use (the auto shotgun being a firm favourite here). 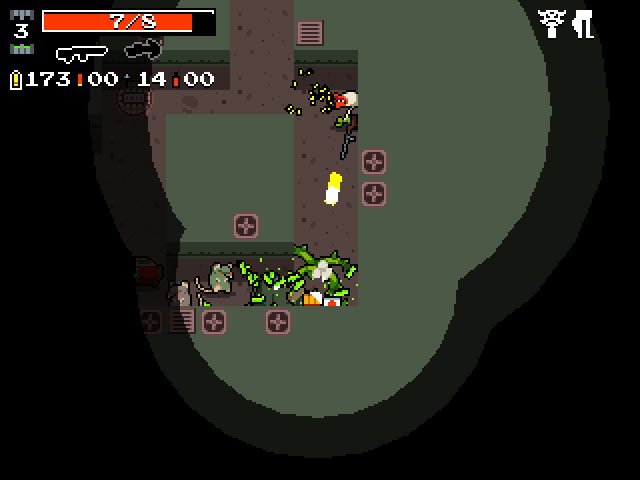 It's just too easy to forget to use short, controlled bursts when you are spitting out flak all over the screen. Combined with the special powers, interesting strategies can be explored by the player, such as using The Eyes' mind control power to line up enemies single file and pinning them all to the wall with a single crossbow bolt. 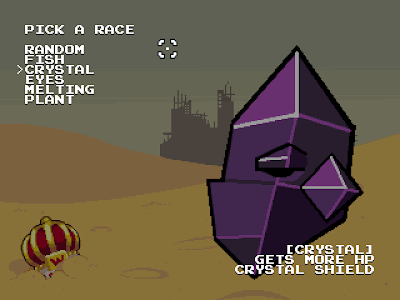 The characters unique stats and powers offer different play modes to suit a variety of gaming styles; do you go for the tank-like Crystal with his shield, or opt for the Plant and his ability to spit out balls of vegetation, ensnaring enemies? Or what about Melting, with his ultra-low HP yet extremely lethal 'exploding corpses' special attack? The presentation, again considering that the game was developed over three days, is exceptional. Paul Veer's artwork, that golden age arcade style he seems to pull off so effortlessly, suits the game perfectly - but it has to be said that more than anything else it is the music and sound effects that take centre stage in Wasteland Kings. Instead of the expected chip music and sfxr bleeps and buzzes, Jukio Kallio (Kozilek) delivers an atmospheric, movie-like soundtrack that ranges from headphone-blasting distorted percussion, feedback, moody guitar noodling, droning alien vocals and heavy synth bass - further complimented by Joonas Turners beefy explosions and mutant grunts and snarls. The soundtrack is actually available on its own EP from Kozilek's bandcamp page (priced at four euros) and is well worth checking out. In conclusion, it's both inspirational and typically Vlambeer-ish that despite all the preparation work underway for the launch of Ridiculous Fishing (iOS) and the ongoing development of Luftrausers (Steam), Rami Ismail and Jan Willem Nijman still found the time to collaborate in Mojang's event to produce this perfect slice of arcade pie. It's just a shame that only those who donated whilst the event was live on humble bundle will be able to sink their teeth into it. Here's hoping for a future Luftrauser-to-Luftrausers style future rework - at the very least Wasteland Kings deserves online scoreboards for each character class (or even offline, failing that) and dual-stick joypad controls would have been the cherry on top. With a little more work it could easily become their best game to date. 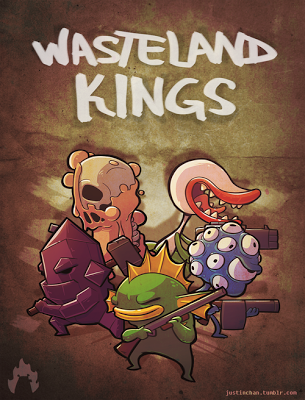 Wasteland Kings is not currently available to download! Having loved Super Crate Box, I was really happy to see Vlambeer putting out another game in this bundle. I agree that it's the shining star of the bunch... had a lot of fun with it. Really dig the art style, too. I can't figure out how these guys can make such amazing games in only a few days?